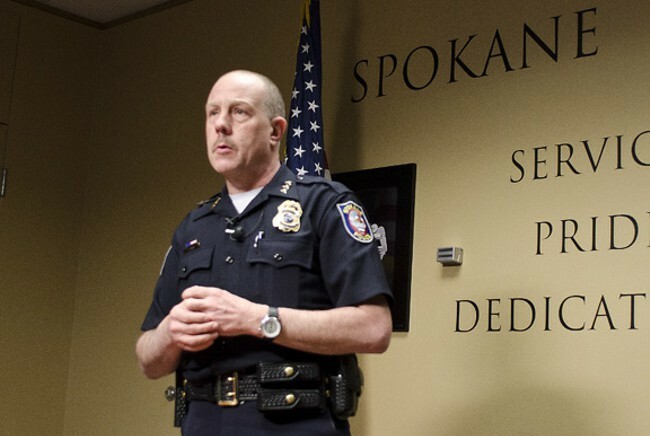 Spokane Police Chief Frank Straub has been forced to resign amid complaints about his leadership style. His last day of employment will be Jan. 1, 2016. In the meantime, Mayor David Condon reassigned him to work under the city attorney, where Straub will focus on criminal justice initiatives and assist in the transition to a new chief, according to a city press release. Some police officials submitted letters about Straub's problematic management style last week. The departure of the department's public information officer, Monique Cotton, is related to the chief's abrasive leadership style, KXLY is reporting. Condon handpicked Straub, whose qualifications were publicly questioned by Sheriff Ozzie Knezovich before he started. At the time, Condon said selecting Straub as his new police chief might be the most important decision of his first term in office. Condon is facing re-election in November against Shar Lichty, who has made Condon's efforts at reforming SPD a campaign issue. The story is developing. Check back for updates.